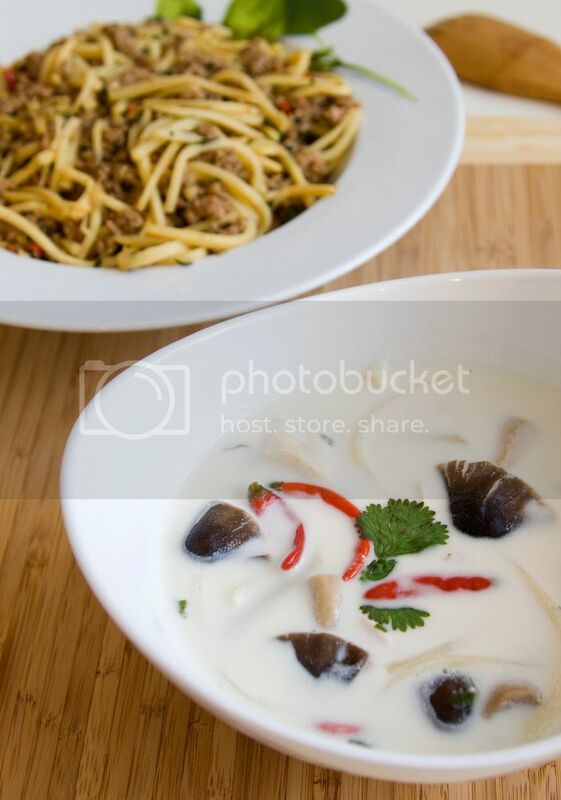 Food Makes Me Happy: Tom Kha Gai - First Time Making Thai Food! In fact, it was presentation night, and I haven't eaten anything since early afternoon. I swear I was seeing grilled steak and tom kha gai (chicken galangal soup) walking around the classroom. It was my first time making this Thai soup a week ago, and I'm absolutely in love with it. Ingredients (4 to 5 bowls)? This recipe is actually fairly easy as long as you have all the ingredients on hand. Toss in galangal slices, lemon grass, and chilies while the soup is heating up. Now that's the section we'll use in the soup. Chop the stems into 2 inches length, we're all set! I suggest you go easy on these ingredients first and gradually adjust into your preference. Couple minutes then the soup is ready to serve. See, not hard at all right? *I feel like I'm still seeing steak walking around.. This is new to me but it looks delicious! Great job. I haven't made any Thai food yet either. It's just so unfamiliar to me... Not the food, I've eaten plenty of that, but the cooking! I would love to make some thai food though. Ha that was some stir fry ground meat with bamboo shoots. I wish I can just hand you a bowl of soup!